In today's essay, I'd like to show you an investment strategy that's so simple and so effective, I call it the "magic portfolio." It's a way to guarantee that you will beat the market. This idea combines buying the highest-quality businesses with extremely stable stocks. When used to build whole portfolios, this combination produces market-beating results with about half the volatility of the stock market as a whole. The outstanding returns aren't the real magic, though. The real magic is that you can achieve these results with much less risk and much less volatility than you would experience if you simply bought an index fund. My research team and I discovered that this concept is possible because of our results from Stansberry's Investment Advisory portfolio holding Hershey (HSY). We recommended Hershey at the height of the stock market in December 2007, right before the worst bear market of our lifetimes. Yet Hershey has gone on to outperform the S&P 500 since then with far less volatility. The trick is finding stocks that are able to do this. After spending hundreds of hours researching and back-testing our ideas, we believe we've found a formula that allows us to consistently identify companies like Hershey. This "magical" formula is the most valuable information we've ever discovered about stocks – by far. It incorporates everything we've learned about how businesses, investing, and the world work. So how do you identify a "magic" stock? • Be fairly priced (trade for 12 years' worth of cash profits or less). Here we use earnings before interest, taxes, depreciation, and amortization ("EBITDA") as our measure of cash profits. We compare a company's enterprise value (the value of its stock plus its debt less the cash it holds) to its EBITDA. A ratio of 12 or less is a good indication that the stock is cheap. We back-tested stocks that met these four criteria for 34 separate periods over the last 15 years. The number of stocks meeting all of the criteria over these periods ranged from 38 to 90, and the average was approximately 70. As I mentioned, we call the group of companies that meet these criteria "magic" stocks. These portfolios beat the S&P 500 over these periods 53% of the time. On average, they beat the S&P 500 by 2.8% a year (280 basis points, annually) with far less volatility. During bear markets, these types of stocks really shined. If you would have bought all of the stocks that qualified as "magic" at the beginning of the bear market in March 2000, by the end of that bear market (October 2002), you would have beaten the S&P 500 by a massive 30.4% per year, returning 8% versus the S&P 500's -22.4%. If you did the same thing at the beginning of the bear market in October 2007, by the end of that bear market (March 2009), you would have beaten the market by 8.9%. We realize buying around 70 stocks isn't ideal for most investors. So we found a simple way to significantly reduce the portfolio size while improving on these incredible results. All you have to do is focus on buying businesses with great brands. We compiled a list of the world's best brands from rankings published by a market-research firm every year. We removed any company that didn't have a great "brand," as identified by this market-research firm. That cut down the portfolio size by nearly 90% to around 10 stocks – a much more manageable number for individual investors. We put this smaller list of stocks – our "magic" stocks with great brands list – through the same evaluation periods. These portfolios, even though they had far fewer stocks, performed even more consistently than the larger "magic" stock portfolios. The "magic" stocks with great brands portfolios beat the S&P 500 over the 34 periods we tested 74% of the time. Across all periods, they beat the S&P 500 by an average of 4.7% a year (470 basis points, annually). And again, they accomplished this with far less volatility. Why does focusing on great brands improve results so much? Because companies with great brands don't have to spend as much on capital expenditures, research and development, or marketing as other firms. As a result, they have lot more cash left over to spend on shareholders in the form of dividends and share buybacks. Eliminating stocks from our "magic" portfolios that didn't have one or more great brands increased the amount of cash returned to shareholders by about 50%. Seeing this result made us wonder what would happen if we added another layer on top of our previous criteria. What if we demanded that all of these firms display excellent capital efficiency in the form of shareholder returns? What if we demanded they return a minimum of 10% of their revenue to shareholders? This criterion produced our most selective list yet – capital-efficient, "magic" stocks with great brands. The results were so good, they even surprised us. The capital-efficient "magic" stocks with great brands portfolios beat the S&P 500 over the 34 periods we tested 82% of the time. Across all periods, they beat the S&P 500 by an average of 6.3% a year (630 basis points, annually). And once again, they accomplished this with far less volatility... about 30% less. Finance professors say this is impossible. But our extensive back-testing proves otherwise. This approach allows you to build relatively small portfolios (not dozens and dozens of stocks) that can produce fantastic results with stocks that are vastly safer than simply buying an index fund. In short... I don't think a better strategy exists for individual investors. These results are clearly better than any newsletter that has ever been published... and better than just about any investment fund in existence. This is truly the ultimate portfolio. Dr. David "Doc" Eifrig says not investing is one of the biggest mistakes you can make if you want a wealthy retirement. Fear prevents most people from starting... and it also will ruin your financial future. Learn more here. "Bull markets don't have an expiration date," Steve says. "They don't have a life expectancy." The U.S. stock market has gone up for seven straight years. Steve says that doesn't mean they're headed for a down year in 2016. Learn why right here. 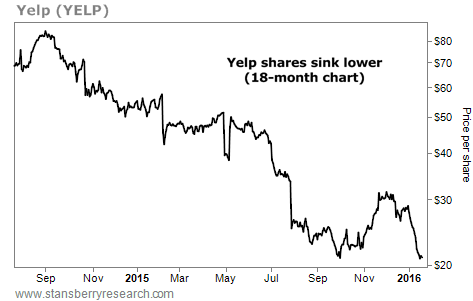 Over the past several months, we've kept a close eye on online-review website Yelp (YELP). Yelp is one of the Internet's sounding boards. People go to review all types of businesses. If you just ate at a local restaurant, you can tell other users about your experience. But as Stansberry Research founder Porter Stansberry has warned, the company's business model is questionable... many small-business owners (Yelp's primary revenue source) feel extorted... the company will likely have trouble growing in smaller markets and internationally... and it may face legal challenges. As you can see from the chart below, all of these problems have sent Yelp shares plummeting. The stock is down around 70% over the past year and a half and shows no sign of changing course any time soon. These are the types of companies you want to avoid... or consider betting against.